'Rapper's Delight': The One-Take Hit It took the Sugarhill Gang, and a song called "Rapper's Delight," to get the developing hip-hop art form on the radio. 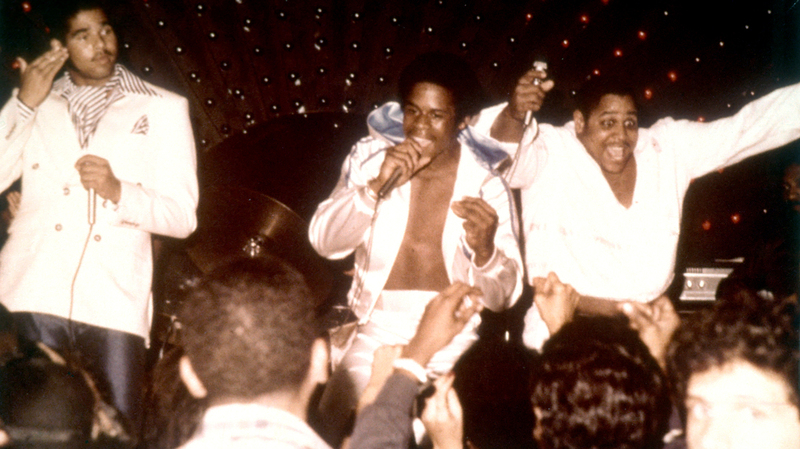 Rap pioneers the Sugarhill Gang (left to right: Wonder Mike, Master G and Big Bank Hank) perform live circa 1979. Henry Lee Jackson died Tuesday. He was known all over the world as Big Bank Hank, one-third of the pioneering rap group the Sugarhill Gang. Jackson died Tuesday morning in Englewood, N.J., of complications from cancer. He was 58 years old. We remember Big Bank Hank with the story behind Sugarhill Gang's iconic song. "Rapper's Delight" is built on the rhythm of an earlier cultural phenomenon: disco. The groove was taken from the tune "Good Times" by Chic. The song was such a big dance hit that a small New Jersey label thought it might be able to capitalize on its popularity. All Platinum Records was co-founded by Sylvia Robinson, who'd had a few hits of her own — "Pillow Talk" and "Love Is Strange" — as part of the duo Mickey & Sylvia. But by 1979, her label was facing bankruptcy. Robinson's son Joey says she saw a way out of Chapter 11 one night at a Harlem club. "She saw where a DJ was talking and the crowd was responding to what he was saying, and this was the first time that she ever saw this before," Joey Robinson says. "And she said, 'Joey, wouldn't this be a great idea to make a rap record?' "
The story goes that Big Bank Hank, Wonder Mike and Master Gee met Sylvia Robinson on a Friday and recorded "Rapper's Delight" the following Monday in just one take. The "Rapper's Delight" 12-inch was released in September 1979. It was 15 minutes long, and yet black radio started playing it — so much so that Sugarhill Gang recorded a seven-minute version for pop stations and introduced the black neighborhood sound of the 1970s to white listeners. Harry Allen, from The Village Voice and Vibe magazine, says that, until then, rap had been for young black males with few opportunities. It gave them a way of making their voices heard. "So what hip-hop fashioned," he says, "was a conduit whereby people who normally are locked out of telling get to tell." But perhaps the reason "Rapper's Delight" crossed over was that it was anything but political. "It wasn't too heavy," Wonder Mike says. "It wasn't the message that was years later. It wasn't 'bash the police' — that was years after that. What I wanted to portray was three guys having fun. We were always bragging about stuff we didn't have to impress the chicks." Like a lot of hip-hop culture, "Rapper's Delight" created its share of controversy — starting with the fact that its playful groove did not reflect the urban anger of other rap at the time. The Sugarhill Gang was also criticized because two of its members were from New Jersey. And none of them had ever been a DJ or an MC. "DJ AJ, Grandmaster Flash, Afrika Bambaataa, Kool Herc — all of these guys were local DJs who would do local shows here in New York," Bronx rapper Kurtis Blow says. "So when the Sugarhill Gang made it, the guys who had been doing this thing sort of felt like they were being ripped off — or, you know, 'These guys are not a part of the Bronx, and they didn't struggle to bring hip-hop to this point to 1979.' And so there was a lot of animosity toward the Sugarhill Gang in the beginning." Despite some additional controversy surrounding who wrote the rhymes, "Rapper's Delight" is an important record. Kurtis Blow said it jump-started the careers of several Bronx rappers, including himself. "When it came out, nothing was the same afterwards," writer Harry Allen says. "It made everything else possible. I was speaking to my good friend Chuck D, of Public Enemy, and when he first heard that there were going to be rap records, his thing was, 'How are you going to put three hours on a record?' Because that's the way MCs used to rhyme. They'd just rhyme and rhyme and rhyme for hours." " 'Rapper's Delight' was kind of like the thing that said, 'This is how we're going to do it.' And then everyone else said, 'Oh, I get it.' It kind of made it palpable. And by making it palpable, it made hip-hop as a commercial medium possible."